For the past 42 years Mayor's Cup Festival & Regatta has been all about celebrating summer in the North Country and paying special tribute to our beautiful lake. 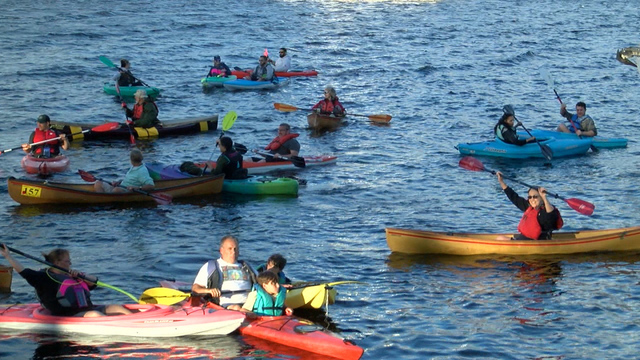 In 2018, Sunrise Rotary was very excited to introduce a new event, the Great Champlain Kayak Chain - that took place on Friday, July 6th at 7pm at the small boat launch at the Plattsburgh City Marina. 30 plus boats were part of history as we came together for our first attempt to create a chain or link of non-motorized boats from the Plattsburgh City Marina to Wilcox Dock. Unfortunately, unusually strong winds made it impossible to link boats for a sustained period of time but the boaters had wonderful time enjoying the lake and the festive atmosphere. There was no charge for Boaters and Landlubbers to come down and enjoy the Great Champlain Kayak Chain! Thank you to Eagle Country for providing music at the marina! Stay tuned for information on the 2019 event!